Two neighboring galaxies appear to be playing a cosmic game of "tug-of-war" with an enormous swath of gas and debris. Two galaxies surrounding our Milky Way are playing a game of gravitational tug-of-war, and new data from NASA's Hubble Space Telescope has revealed the cosmic winner. The two players are the Small Magellanic Cloud (SMC) and its more massive sibling, the Large Magellanic Cloud (LMC). Not only do these two galaxies orbit our Milky Way galaxy, but they also orbit one another. As the two dwarf galaxies tug at each other gravitationally, one has pulled out a huge amount of gas from its companion, creating what astronomers call the Leading Arm. "There's been a question: Did the gas come from the Large Magellanic Cloud or the Small Magellanic Cloud? At first glance, it looks like it tracks back to the Large Magellanic Cloud," Andrew Fox, lead researcher from the Space Telescope Science Institute in Baltimore, said in the statement. "But we've approached that question differently, by asking, 'What is the Leading Arm made of? Does it have the composition of the Large Magellanic Cloud or the composition of the Small Magellanic Cloud?'" The Leading Arm is a large swathe of gas and debris that is being pulled inward toward the Milky Way and fueling new star birth in our galaxy. This arching gas structure is believed to be about 1 billion or 2 billion years old and roughly half the size of the Milky Way, according to the statement. Using data from the Hubble Space Telescope, the researchers analyzed the Leading Arm for chemical signatures, or traces of different elements, that would indicate where the gas originated. Researchers observed the light from seven quasars — or ultrabright galaxy cores — that were located behind the Leading Arm to chemically analyze the gas. The scientists were able to measure how light from other distant galaxies filters through the gas in the Leading Arm using& Hubble's Cosmic Origins Spectrograph. Specifically, they looked for the absorption of ultraviolet light by oxygen and sulfur in the Leading Arm, which would indicate the presence of heavier elements in the gas. Their findings were compared to measurements made by the Green Bank Observatory in West Virginia, as well as several other radio telescopes, the researchers said. "With the combination of Hubble and Green Bank telescope observations, we can measure the composition and velocity of the gas to determine which dwarf galaxy is the culprit," Kat Barger, a researcher from Texas Christian University who was involved in the study, said in the statement. The study, published Feb. 21 in The Astrophysical Journal, shows that the LMC is pulling gas from its smaller companion. 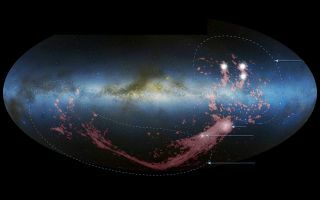 Furthermore, because researchers have observed the gas of the Leading Arm crossing the disk of our Milky Way galaxy, the new findings shed light on the inflow of gas in other galaxies, as well as the gas that fuels the birth of new stars, the researchers said. Therefore, "sometime in the future, planets and solar systems in our galaxy may be born out of material that used to be part of the Small Magellanic Cloud," the statement said. Going forward, the team plans to map the full size of the Leading Arm, which remains unknown, according to the statement.